Designed with Windsor's Patented Chariot Stand-On Technology for increased productivity and maneuverability. Two 22" counter-rotating brushes provide pre-sweeping, scrubbing and vacuuming in one pass for thorough cleaning especially on grouted and structured surfaces. Electrical: 36V, 3 x 12V 114 AH batteries, onboard charger. 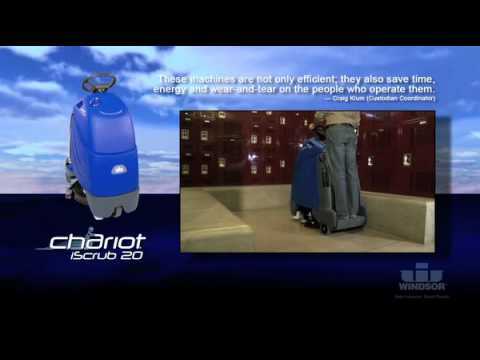 An ultra-tight turning radius enables Chariot to run around in five foot aisles with room to spare. Greater access in tight areas, increasing your floor cleaning coverage. Intuitive control panel and an easy-to-clean, fully accessible hygienic recovery tank. Quiet operation for daytime cleaning. Ergonomically designed leg panel for increased operator comfort. On-board charger can be used with any standard wall outlet. External fill-port provides easier access to fill solution and water. 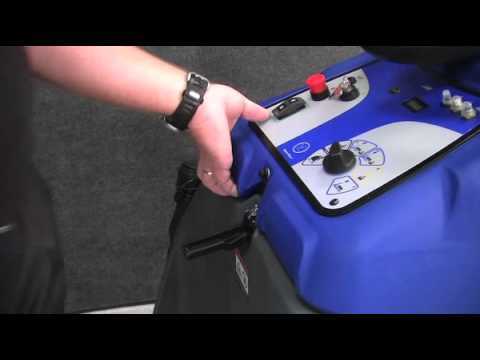 Operator-presence foot pedal for safety during operation. Tie-down bar provides easier transport. Cylindrical counter-rotating brushes incorporate sweeping and scrubbing in one pass. Easy access to the debris tray for dumping and cleaning. Wide-open access to battery compartment. Effortless access to recovery tank for easy cleaning. Intuitive function control system with preset cleaning settings simplifies training and provides more consistent cleaning results. Weight w/o Batteries: 255 lbs.